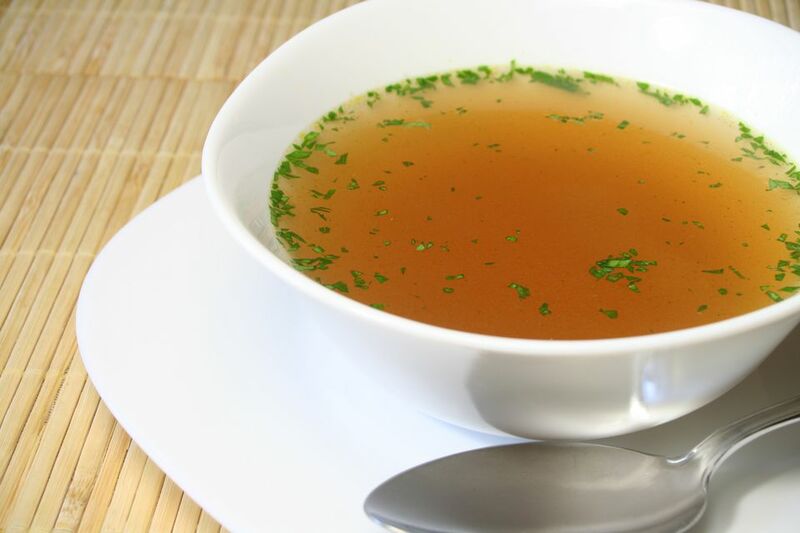 Bouillon -- pronounced "BOOL-yone" -- is a clear, flavorful broth made by simmering beef, chicken or vegetables and other ingredients. The main difference between bouillon and stock is that bouillon is made by simmering meat, whereas stock is made by simmering bones. Also, stock is generally unseasoned or only lightly seasoned, while bouillon is seasoned to give it a strong flavor. While it can be used as a base for making soups and sauces, bouillon itself is simply a clear, seasoned broth with no solid ingredients. Bouillon and broth are synonymous, and if you serve broth as a dish by itself, then it's called soup. But, most cooks find uses for bouillon that go well beyond serving it as soup. The best way to include bouillon in your dishes is to start by making your own: Avoid using bouillon cubes, which are high in sodium. It's an all-day project, where you'll simmer beef as well as celery, carrots, turnips, and onions. Trust me: The flavor is well worth the effort. You can then use the bouillon as a base to create such dishes as beef barley soup or vegetable beef soup, or even for cooking pasta in a chicken bouillon-based sauce, as the National Pasta Association suggests. While the pasta cooks, it will absorb the tasty chicken flavor, the association notes. According to Amy Brown in Understanding Food: Principles and Preparation, bouillon is actually the French word for broth. "Traditionally, this type of soup is called bouillon if it is based on beef and court bouillon or fumet if it is prepared using fish," Brown writes. "Court is the French word for 'short,' and it describes the preparation time for bouillon, which is much shorter than for stocks." Indeed, the simplest court bouillon consists of nothing but salted water, and some traditional recipes call for a mixture of half salted water and half milk. You can easily create court bouillon using a mix of aromatics and spices, which will give you a flavorful base for poaching most kinds of fish and shellfish. If you are looking up bouillon recipes, avoid confusing the term with the word "bullion," which refers to "uncoined gold or silver in bars or ingots," according to Merriam-Webster. Remember the French origin of the word for this broth, and you'll be using it to create soups, cook pasta and even poach fish in no time.